Afghanistan Orthodox Temple"There is an actual Orthodox Church in Afghanistan. Let me say that again. There is a Church- not just a chapel – here in Afghanistan, which is to our knowledge the only free-standing, permanent Church structure of any kind in the entire country." Fr. David Alexander, Antiochian Orthodox priest and chaplain described this and other amazing discoveries in his post-Paschal letter to his home parish, St. Anthony's of Bergenfield, New Jersey. "I nearly broke down in tears while reading the sermon of St. John Chrysostom, and again while giving communion to a newly chrismated member of my Battalion for the first time," wrote Fr. David describing his Pascha at Camp Leatherneck. Recently Antiochian.org interviewed Fr. David, who also reflects on his unique and challenging life in his AFR podcast In the Valley of the Shadow of Death. 1. 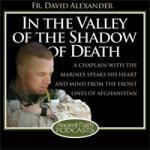 Can you give us a thumbnail sketch of how you ended up as an Antiochian Orthodox Christian, serving as a chaplain in the middle of the conflict in Afghanistan? Well, I am a priest of the Antiochian Archdiocese serving on active duty as an officer in the Navy Chaplain Corps. Because the Marine Corps is under the Department of the Navy, they have Navy chaplains, doctors, and combat corpsmen (medics) serving with them all over the world. I was assigned this past summer (2009) to a Marine Battalion at Camp Lejeune, NC, and my Battalion was part of the first surge of Marine forces to Afghanistan after President Obama’s December decision to increase troop strength and go on a renewed offensive. We arrived shortly after the New Year. 2. What can you tell us about your daily life and duties? That can be a bit complicated. My primary duties are with my Battalion, where I serve in the following four roles: (a) Liaison to local and international religious leaders, (b) advisor to the commanding officer on moral and ethical issues, (c) first responder to interpersonal crises, including conflicts within the chain of command, and (d) a protector of religious freedom. The majority of my time is spent in general supportive counseling with Marines, but I also spend a lot of time just traveling out to see them all, as they are scattered in 4-5 different places in Helmand Province. I also visit the wounded regularly, and occasionally have the great and sorrowful responsibility of honoring the dead. On Sundays I serve the Divine Liturgy, usually at Camp Leatherneck, where we have 17 Orthodox Marines and Sailors. But the Orthodox-specific work is where my overall duties get a bit complicated. As the only Orthodox priest not only for all branches of American Forces, but also for all of NATO, I travel quite a bit to provide for Orthodox throughout the country, including troops from Romania, Bulgaria, the Republic of Georgia, the UK, Canada, the Netherlands, and contractors from Russia, Albania, and Macedonia. With the recent arrival of one Georgian and one Romanian chaplain, that workload should decrease considerably. 3. As an Orthodox Chaplain, how much interaction do you have with other Christian groups or individuals, and how much with those of no religious background? What does the Church give you by way of tools and resources that you can, in turn, share with those in need around you? About 70% of my Battalion considers themselves Christians of some kind. Out of that 500 Marines or so, there are almost 200 Roman Catholics, almost 300 Protestants, a handful of Mormons, and 5 Eastern Orthodox (we have members of the Serbian, Carpatho-Russian, and Antiochian Archdioceses). The leftover 30% is a mix of agnostics, former Christians no longer practicing or believing, secular humanists, and a couple of Buddhists and Muslims. In short, I interact with other faiths (and people of no professed faith) constantly, because of the nature of the work. I see most of my work as simply interacting with a diverse people in relationships of love, hopefully the love of Christ, which often gives me opportunities to talk about God and the faith of the Orthodox Church. As for resources, the Church gives more than I can possibly receive. I find myself using concepts I have gathered in the Church’s daily readings, lives of the saints, and monastic writings almost every day here. It is remarkable how often my morning prayers and readings speak not only into my daily needs, but also into the daily needs of people that come to talk with me later in the day. In this way, I have an extremely freeing sense of being carried along by a Wisdom greater than my own in my encounters and travels – something the people I work with need every bit as much as I do. 4. What are some of the greatest struggles and challenges you and your men face as you serve there? Any unexpected rewards? Well, the greatest struggle here is the separation from my family. Anyone who has ever met my wife Maria knows exactly why this is. Her patience, flexibility, optimism, eye for beauty, and healing hands are God’s greatest gifts in my life, and being away from her is excruciating. I have also missed so many things in the life of my daughter, Eve Marie: first words, first steps, first birthday, and the list keeps growing. Another struggle is the utter lack of time off. Marines don’t take days off. There is work, and then there is rest, but just enough rest to get back to work. I was unprepared in some ways for the grueling “operations tempo” out here. One of the unexpected rewards has been to serve at a Church in Kandahar, built on the Romanian NATO complex, for Palm Sunday. Over 50 people from 9 different nations attended, and the joy of coming together (many people had not been able to attend an Orthodox service for the better part of a year) is almost beyond my ability to describe. Another unexpected joy came at Pascha, where I gave communion to an officer in my Battalion for the first time – he had been chrismated just an hour or so earlier! 5. How much interaction do you have with the Afghan people, and how would you describe your encounters in that cultural context? This is also complicated. As our Commanding General has said, the Afghan people are not our enemies, but our enemies hide among them. This certainly shapes our interactions with them in many ways. As we interact with people, we are both trying to lend aid and understanding and also to remain vigilant for signs of danger. The language barrier is also very stark. We have interpreters with us when we travel, but not speaking Pashtu or Dari keeps me from speaking freely with people most of the time. My main personal interactions with the Afghan people have been members of the Afghan National Police and Afghan National Army, with whom we are partnered in our missions. There are mullahs (Muslim clerics) assigned with these units, whom I have had tea with on occasion, and spoken with about the likenesses and differences in our faith. I do think that Orthodox Christians can sometimes be in better positions than other Christians to converse with Islam, not only because of our common Eastern heritage but because of the rigorous nature of our life and piety. Although I would not say the mullahs are impressed with our fasting in general, they are surprised at the length and breadth of our fasting, which is contrary to their understanding of most Christians in the West. The same thing goes for the amount of times we pray daily, and our (relatively) robust cycle of services on weekends. There are some cultural disconnects. I do not (cannot) wear a beard, which is a key symbol of leadership and credibility among men in this culture. I am also young, in my early thirties, and have a young face, whereas the mullahs here are elders among their units. In this way I am the object of some curiosity to them, and perhaps am not taken as seriously as I otherwise might be. Nevertheless, my main responsibilities with them, as I see things, is to behave respectfully, engage them with understanding and warmth, and express love for them as human beings. This I do to the best of my ability, and I also debrief with other chaplains, who are more experienced than I am. I am learning a lot. 6. How can we as the faithful in the U.S., support you? How can we help your family? Is there a way for us to encourage other Orthodox military personnel in Afghanistan? Of course the primary way that you can support me is to pray for me and my family. The faithful from Churches in America (of several jurisdictions, now) have sent so many things – candles, Easter breads, icons, oils, prayer books, prayer ropes, letters and care packages, bottles for Holy Water – but I am doing okay right now in terms of resources. 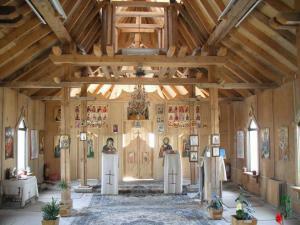 As for encouraging the Orthodox faithful here, it is always welcome for anyone to send letters of encouragement, and perhaps some small quantities of small religious items to hand out to people. I would read those letters after Liturgy and distribute the items.